A lot of properties take out ads after the event to thank their sponsors, or include sponsor logos at the bottom of their ticket advertisments aimed at consumers, but it's rare that you'll see a full page ad taken out to justify the value of sponsorships. 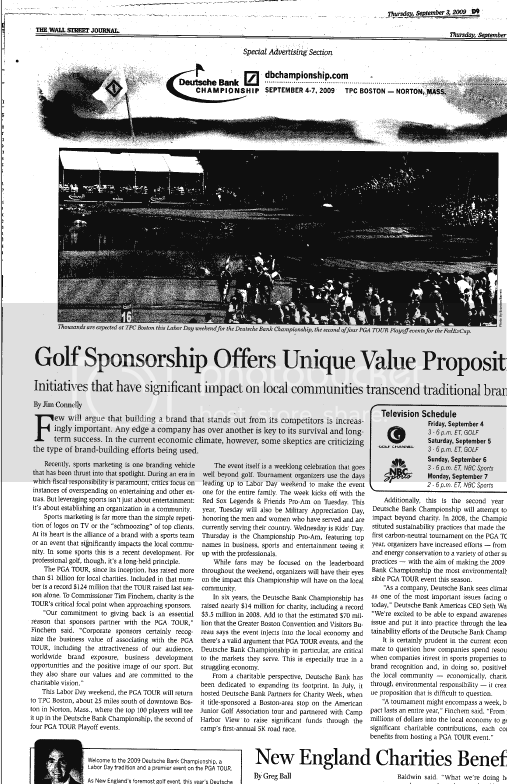 If you were flipping through the Wall Street Journal yesterday you might have seen the title "Golf Sponsorship Offers Unique Value Proposition" and not thought otherwise. At the top however you'll see "Special Advertising Section," presumably the advertiser being either the PGA Tour or Deutsche Bank Championship. These type ads don't come cheap. The cost of a full page WSJ ad can run anywhere from $100,000-$200,000. Not in the budget for many properties. This is followed up by a mention of the $14 million the DB Championship has raised for charity and the $70 million the Greater Boston Visitors and Convention Bureau says it injected into the local economy. Finally, a couple quotes from Deutsche Bank's CEO and PGA Tour commish Tim Finchem. This is certainly a well penned piece that raises a lot of very solid points on behalf of the PGA Tour. Sure, the tactic seems a bit defensive, but tough times call for tough measures I suppose and the Tour has been under heavy fire from media critics. Today, IEG forecasted that North American spending on golf sponsorships will be off 3.7% this year. All of this brings up an interesting question. Should properties ever advertise their sponsorship opportunities in their local hometown paper or media outlet? Tools like Spotrunner and Brand Affinity Technologies are making it easier, and less expensive to create and buy media. Big thanks to Christina from Atlanta for spotting this in yesterday's Wall Street Journal and bringing it to our attention! Have you seen other similar ads and will this strategy be successful in a) influencing the pervasive opinion of golf sponsorships as excess and b) landing some sponsorship leads for the PGA Tour?